The theme of this year’s NAIDOC celebrations is ‘Our Languages Matter’. The theme of this year’s NAIDOC celebrations is ‘Our Languages Matter’. * There are approximately 120 Indigenous languages spoken in Australia today, far less than the 250 distinct language groups that existed at the time of European contact. Due to the aging population many of the remaining languages are also at risk of being lost. Languages are often intertwined with cultural identity and for thousands of years have been used to pass on knowledge of Aboriginal and Torres Strait Islander history. “The preservation and revitalisation of the Aboriginal and Torres Strait Islander languages – the original languages of this nation – is the preservation of priceless treasure, not just for Indigenous peoples, but for everyone,” NAIDOC Committee Co-Chair Benjamin Mitchell says. Ahead of this Year’s NAIDOC Week, which was born out of a Day of Mourning protest on Australia Day in 1938, a nine-metre mural in Shepparton was unveiled. It depicts the man who pioneered the Day of Mourning protest, Yorta Yorta activist William Cooper, and a supporter, Sir Douglas Nicholls. The tireless work of Yorta Yorta activists like Cooper and Nicolls are documented in the St Vincent de Paul Society’s 2016 spring edition of The Record. Dedicated to Solidarity with First Peoples, the edition represents part of the St Vincent de Paul Society’s commitment to respectfully learning from the First Peoples of Australia, as we journey together towards the building of a more just and compassionate future. The St Vincent de Paul Society National Council is also engaged in advocacy campaigns in solidarity with the social justice struggles of our First Nations sisters and brothers. 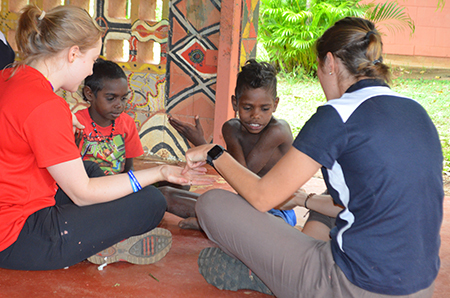 Our National Indigenous Immersion Program celebrates its 17th anniversary in 2017, and is one example of the strong relationships that can be forged between the Society and Indigenous communities. The annual two-week long program takes place in the Indigenous community of Nganmarriyanga (Palumpa), in the far north-west of the Northern Territory. Visit www.recognise.org.au for more information about the campaign for recognition of Aboriginal and Torres Strait Islander People in the Constitution.